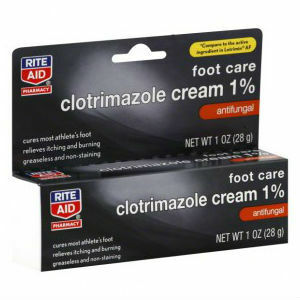 Welcome to our review of the anti-fungal cream Rite Aid Clotrimazole. This product aims to help treat athlete’s foot and other forms of fungal infections on the feet. It also claims to help alleviate the symptoms that come with fungal infections such as itching and redness. If you are interested to learn more about this product, please read our in-depth review below. You must first ensure that the affected area is carefully cleaned. Use a combination of lukewarm water and soap to disinfect the area and dry it off using a clean towel. Once dried off completely you can then apply a thin layer of Rite Aid Clotrimazole Cream over the affected area. Cleaning and application must be done twice a day during the morning and evening or as instructed by your doctor. Please keep in mind that this anti-fungal solution does not work on the scalp and nails. If you are treating athlete’s foot or a ringworm infection you should pay closer attention to the areas between the toes as fungi can survive in those areas. Wear well-ventilated shoes and always wear clean socks. Positive results will usually appear within 4 weeks when treating athlete’s foot. Rite Aid Clotrimazole Cream uses some powerful ingredients that may cause irritation on sensitive skin. Common side effects that can occur are itchiness, redness and a stinging sensation. If you experience any of these symptoms, please discontinue use of the product and contact your doctor immediately. Rite Aid Clotrimazole Cream is priced at around $10.29. It is available for purchase on Rite Aid’s official website and in most pharmacies and local drugstores. Each tube of anti-fungal cream contains about 28 grams of the solution which will last about a month or so if used properly and daily. The official website does not state any sort of refund or guarantee to using this product and the lack of customer testimonials can leave those who are planning to try this product doubtful. Fortunately, it is quite affordable and it is available in most drugstores and pharmacies in your local area. It usually takes about a month for results to be visible and each tube will most likely last a month or so. The Rite Aid Clotrimazole Cream contains some of the most effective ingredients used to fight fungal infections. It is also quite affordable and easy to obtain. Although the lack of customer reviews can be a cause for worry as well as the lack of any sort of guarantee from the manufacturer. It also contains some powerful compounds that have a high chance of causing skin irritations that may exacerbate the infection. Jimmy Rodriguez	reviewed Rite Aid Clotrimazole Cream	on November 19th	 and gave it a rating of 2.